Avengers: Infinity War is only a few weeks away from hitting theaters and as a special promotion, members of the cast and crew are holding screenings around the world where they play the first 30 minutes of this latest Marvel adventure. 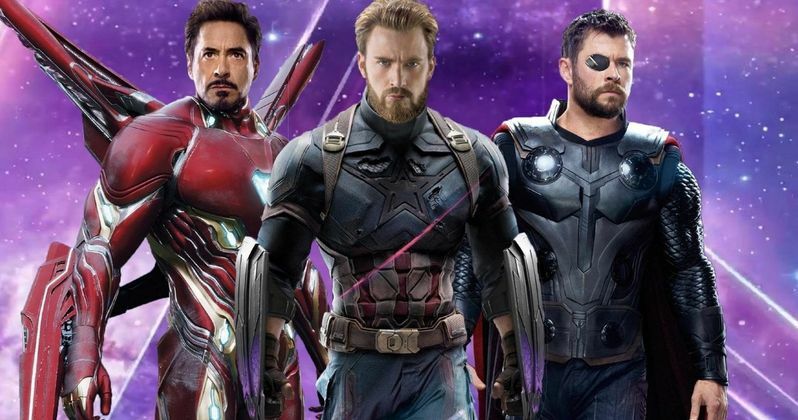 As it turns out, not even the cast has been permitted to see Infinity War in all of its entirety, according to Tom Hiddleston, Tom Holland, and Benedict Cumberbatch. They all have to wait until the world premiere, which is only a few days before fans get to see it. In a new interview, Tom Hiddleston, Tom Holland, and Benedict Cumberbatch revealed that last night's special Infinity War screening in London was the most of the movie that they've ever seen. When asked how the screening went, Cumberbatch said that it was quite extraordinary. The actor went on to say that they were fans just as much as the Marvel fans in attendance. He explains. "It was pretty hyped. It was wonderful. It was the same for us. We haven't seen hadn't seen the footage until last night, so we came out as fanned up as the fans. It was really, really exciting." It makes sense that Tom Holland hasn't seen Infinity War just yet since he is known to unintentionally leak spoilers. However, it was thought that at least some of the cast has been able to see the finished product, especially after Guardians of the Galaxy director James Gunn let the world know that he's seen it. Chris Pratt screened the first 30 minutes of the movie in Brazil last week and also noted that it was the first time that he was able to see so much footage all at once. It seems that Marvel and the Russo Brothers are taking every precaution necessary to make sure that nothing is leaked beforehand. Fans had to wait for months after the first footage of Infinity War was shown at the D23 Expo and San Diego Comic Con over the summer, and it was agonizing. That initial footage was also the very first time that any of the cast in attendance were able to see any footage as well, and they were visibly just as excited as crowds were who were lucky enough to be there. We're hitting the home stretch for Marvel's Infinity War. The world premiere will take place on Monday, April 23rd and then screenings from around the world will begin that following Thursday night. Reviews will go live after 10am on Tuesday the 24th and the social media embargo will lift on the night of the premiere. So, for those fans wanting to go into Infinity War completely blind, you might want to go dark starting that week. You can check out the rests of the interview with Tom Hiddleston, Tom Holland, and Benedict Cumberbatch below, thanks to the Good Morning America Twitter account. "I'm really stressed right now because this is live, so I'm just trying to sit on it and let these guys do all the talking." - notorious secret-spiller @TomHolland1996 on @Avengers: #InfinityWar.